Hehe, sorry. I blame gasman. Yeah, I'd blame Gasman as well, he's got a permanently guilty face! Platform autothumb. And nyan audio in 6khz? Oh yeah. Live footage thanks to m0d: http://www.youtube.com/watch?v=LrmEB-DpZGQ. "Why??? Make it stop!!!" no comment. the live video is hilarious :D Make it stop! Its defo Gasman's fault!!!! Awesome tech achieving! 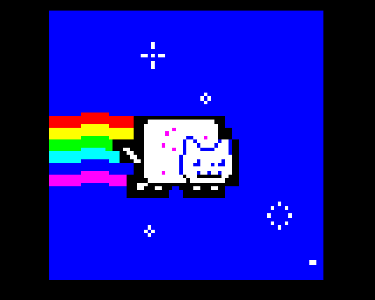 Nyancat not on EVERY platform ....... yet! I heartily condemn this disgraceful slur on my good name. I think the nyancat bandwagon has been ridden sufficiently now that the beeb has one. Doesn't sound all that great sampled though - it would probably sound better as normal tracked music. Anyone got the samples from the original tune? N-Y-A-N CAAAAAAAAAAAAAAAAAAAAT!!! Works well in B-em emu. Nice teletexting there! IRQ sample playback too! Pretty sweet. page created in 0.019365 seconds with 15 queries.